The steeply ridged bluffs of the Loess Hills' Murray Hill rise abruptly from Iowa's farm fields. Courtesy Geological Survey Bureau, Iowa Department of Natural Resources. Eventually, excruciatingly slow processes can make a huge difference. Over geologic time, for example, small movements of rock and soil can transform a landscape. You've heard this speech a hundred times, maybe while goggling photos of the Grand Canyon, which was cut by the Colorado River. But wind can also change landscapes, if you're patient. 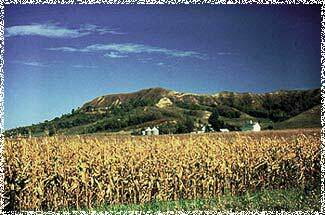 Wind, for example, formed the Loess Hills, which loom above the table-top Great Plains in Western Iowa. Wind also formed the Loess plateau in Central China, near the edge of the Tibetan Plateau. Loess, pronounced "loose," is a gritty, porous, and finely-ground rock that's blown by the wind. Logically, loess requires an adequate wind and a source of ground-up rock. In Iowa's case, the dust came from river-bank mud flats. In China's case, it came from the nearby deserts in the Asian interior. Today, China's half-a-million square kilometer Loess plateau is "very favorable for farms and grazing if the rainfall is enough," according to Zhengtang Guo, of the Institute of Geology and Geophysics at the Chinese Academy of Sciences. Guo e-mailed us to say that "Nearly the whole Loess Plateau is being exploited by agriculture," and it has about one-fifth of China's tillable land and supports more than one-fifth of its population. Loess continues to be deposited today, Guo says, in places where dust storms are common. In the Loess Plateau, "A number of features on the top of the modern soil profiles show that the soil did receive very recent dust deposits. However, the morphology [shape] of the deposits is different from older loess due to human disturbance." The new study of the Loess Plateau, published yesterday by Guo and colleagues in Nature, shows that the deposits are far older than previously thought, indicating that the geological and climatic conditions that produced the loess deposits existed as long as 22 million years ago. Since loess deposits require both wind and aridity, the study of geology quickly takes us to climate. But since the Chinese loess deposits are built like a crunchy layer cake, the climate connection is even stronger. The layers reflect climate: During dry eras when strong winds blow from the desert, you get loess. When it's wet, and/or a different wind is blowing, normal soil accumulates. Ancient soil and loess can be distinguished because soil is reddish and contains organic matter and many finer particles, while loess is paler and grainier. While previous researchers had concentrated on newer deposits, Guo and colleagues examined two locations. In one, the loess layer cake was 253 meters thick. In another, the loess-and-ancient soil layer cake contained 231 layers, representing 15.1 million years of Earth history. Using fossils and a magnetic analysis of the changing polarity of Earth's magnetic field, Guo and Co. established a timeline for the loess. If you do the math -- and we didn't, we hasten to assure you -- on the 15.1 million year record, you'll find that the average loess-soil cycle lasted about 65,000 years. The loess layer cake alternates loess (yellow-brown layers) and ancient soil (reddish layers). Courtesy Zhengtang Guo. That period, intriguingly, corresponds to changes in Earth's orbit that often explain periodic shifts in climate. John Kutzbach, director of the Center for Climatic Research at the University of Wisconsin-Madison, has long studied the influence of Earth's orbit on climate. The Loess Plateau, he says, "is famous for its alternating layers of soil and loess, which have been shown to reflect alternating periods of strengthened summer monsoons (more rain and more soil development) and weaker summer monsoons (less rain, and general increase of aridity during glacial times -- causing loess accumulation). In the recent several million years, these alternating layers of soil and loess are highly correlated with changes in ... solar radiation." The major contribution of the Guo study, Kutzbach adds, is in extending the correlation between orbit and climate. "It is of great interest to see these changes having impacts in the soil-loess records of the period prior to 8 million years ago, just as they have been shown to be present in the records of the Loess Plateau in the past million years." However, the exact roles of orbit on the layer-cake record needs further studies, the authors said. Because the chemical signatures of older and younger loess deposits are similar, Guo and colleagues think the source is probably the same -- deserts to the north and northeast of his research site. 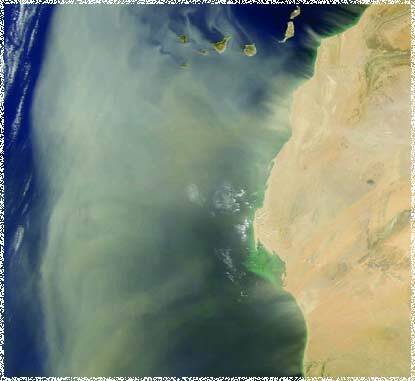 These days, dust reaches the plateau via winter monsoon winds, pushed by the Siberian high pressure cell in the atmosphere. The same atmospheric conditions may have existed when the loess started accumulating 22 million years ago, Guo says. The rising Himalayas cut off rain to the hinterlands, helping create deserts that supplied dust to the Loess Plateau. Courtesy NASA. The study also indicates that the Himalayas had risen significantly by then. Why? Because if wet winds from the south were blocked by the rising mountains, the resulting aridity could have created the deserts that supplied the loess. Like plate tectonics that continues to shove the Himalayas slowly skyward, loess accumulates gradually -- averaging only 0.017 millimeters per year. That means it may be safe to ignore your mother. Is a miserable 0.017 millimeters of dust enough to justify her harping about that feather duster gathering dust in your closet? Onset of Asian Desertification by 22 Myr ago Inferred from Loess Deposits in China, Zhentang T. Guo et al, Nature, 14 March, 2002.